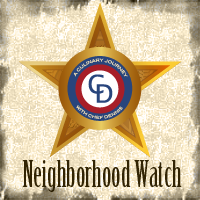 This month, I was assigned Nicola’s blog, Lemon & Cheese. Nicola is a librarian in London (Nicola – we need to talk books! I’m a bibliophile an always have a book in hand!) Nicola also loves trying new foods, but tends toward simple recipes using fresh ingredients and freezer/pantry staples. 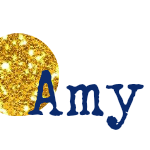 Nicola has been blogging for a long time, so her recipe index is extensive! I had such fun looking through! I’ve been reading quite a lot of British novels lately (Harry Potter, 101 Dalmatians, & Scarlet Feather (actually Irish, but there’s some food overlap) spring to mind), so I was immediately drawn to recipes like Steak & Kidney Pie and Treacle Tart. I also had my eye on Funfetti Shortbread, because I’m a sucker for cookies and sprinkles! 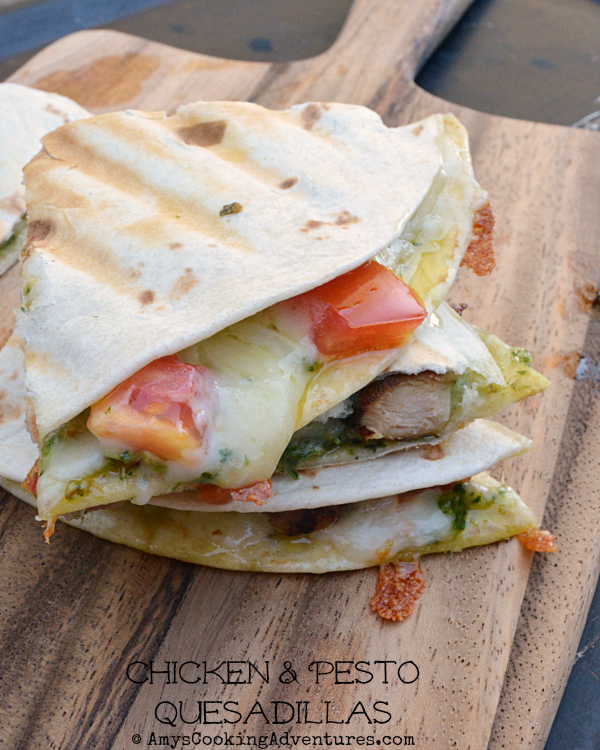 But what really won me over was Pesto and Chicken Quesadillas. I LOVE quesadillas! 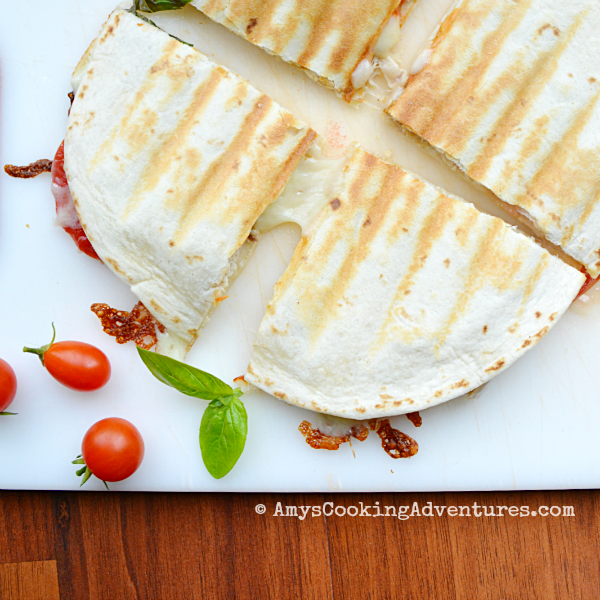 I love traditional quesadillas and I love to play with flavors, so these were right up my alley! The quesadillas were absolutely delish! I mean, it’s pesto & cheese and chicken! How can you go wrong? Now, I have to warn you, these aren’t exactly diet food. Between the olive oil laden pesto & the cheese, they can get a bit greasy, but they are so so worth it! -I used some leftover grilled, season chicken. Rotisserie chicken would also be tasty. Preheat a Foreman grill or panini press. Want more? 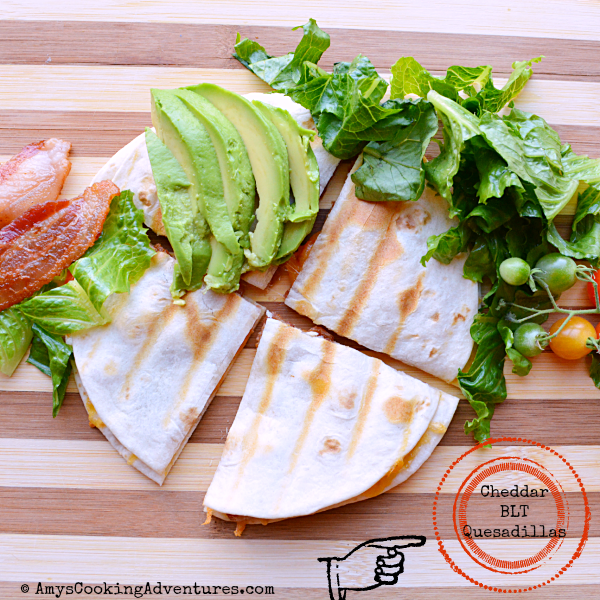 Try these quesadilla combinations! So good, and easy, too!! perfect combo! ooh - looks delicious and a great way to use up leftover chicken! These sound divine! Hubby and I would enjoy eating these quesadillas. 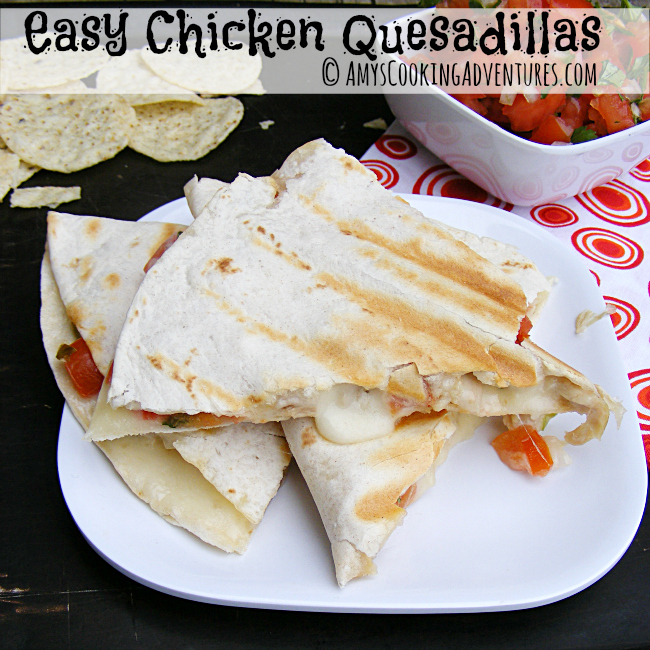 Great choice Amy....Quesadillas are perfect for a busy summer night. 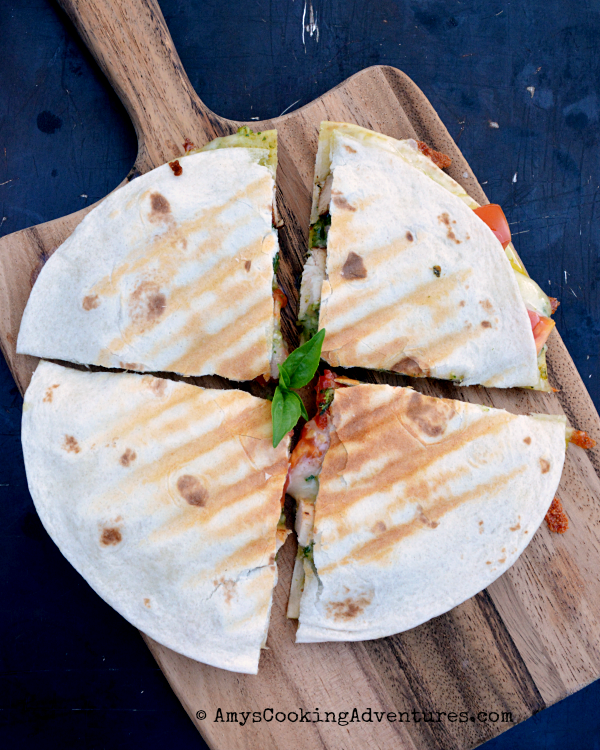 I would have never thought to introduce pesto to a quesadilla! This would be a delicious light dinner! Man I love pesto and I have some chicken in the fridge for which this would be perfect. Thanks for the inspiration! I love quesadillas any time of day. I have a breakfast one that I love! This one sounds divine for lunch with a bowl of homemade tomato soup! You really do love qusadillas! Lol. I like this take, I'll have to try it. I love quesadillas and don't eat nearly enough of them. Love the use of pesto! 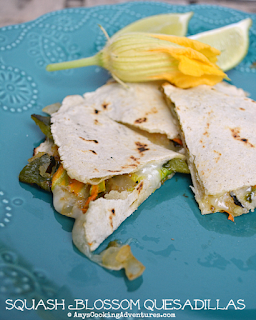 Quesadillas are always a win for a quick dinner.